Over 2,000 cyclists rode from Edwards to Steamboat on Monday, June 11, and then another 200-plus riders joined in on Tuesday, June 12, in a Steamboat loop at the Ride The Rockies Bicycle Tour. The ride continues through Friday, June 15, attracting veteran cyclists as well as new riders. On Monday, June 11, cyclists completed the Ride the Rockies bicycle tour loop from Edwards to Steamboat Springs, in a reverse of stage 1 of the 2015 USA Pro Challenge. More than 2,000 cyclists pedaled into Steamboat, which also hosted a stage 2 loop on Tuesday, June 12. Organizers said Tuesday’s ride drew more than 200 additional people primarily from Colorado, California and Texas. Riders on Tuesday experienced rolling terrain, picturesque views and hit the challenging “Three Witches,” a series of hills on the southeast corner of the trail on Twentymile Road near Oak Creek. Oak Creek Canyon provided the open valley meadows, with mostly flat and straight highway to the south. Two well stocked aid stations were along the route with Skratch Labs hydration and Steamboat-based Honey Stinger waffles, plus food vendors to supplement. Denver resident Steve Fisher, a part of Team Wish for Wheels, said the weather was spectacular. A great time with friends on a scenic and challenging route,” Fisher said. On Wednesday, riders will travel 93 miles and climb 6,200 feet in a Steamboat to Grand Lake stage. 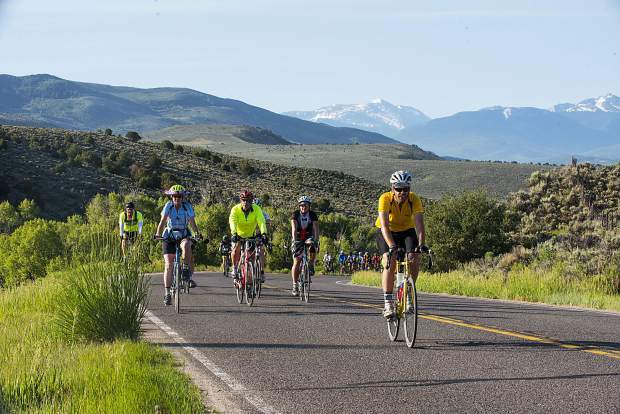 The Ride the Rockies bicycle tour will wrap up on Friday, June 15, in Breckenridge.